Hi! We’re Colin and Michelle. Let’s make teaching less stressful, more fulfilling, and fun. We’re high school teachers who want to help you have a successful teaching career by re-connecting you with the joy of teaching, and showing you how to make a impact for your students without feeling overwhelmed or guilty. These strategies have been classroom-tested and are simple enough that you can to start trying them out in your classroom right away. Sign up for our newsletter and you’ll get a new tactic in your inbox each week. You’ll also get an immediate download of our Teacher Tactics 5×5 Starter Kit, a 15-page guide containing our 25 favorite strategies for the things that matter most: how to cut marking time in half (while still giving descriptive feedback), how to positively deal with difficult students, creative and customizable lesson hooks and openers, 2-minute activities to calm and re-focus your class, and simple self-care tactics to avoid burn-out. 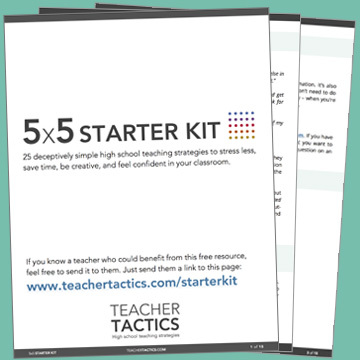 Sign me up to get my 5×5 Starter Kit packed with 25 strategies to save time marking, deal with difficult students, re-focus classes, start lessons creatively, and avoid burn-out. You’ll get immediate access to the guide plus weekly teaching strategies in your inbox. We’re high school teachers who want to help you improve your teaching practice. We’ve been there, and we want to show you what works, so you can re-connect with why you decided to become a teacher, and be successful in your classroom without feeling overwhelmed.